Ever since Donald Trump was elected president and Republicans retained majorities in the Senate and House of Representatives, immigration reform and health care policy have dominated the national political agenda. More local-centric immigration policing has been replaced with federal agencies searching out undocumented populations, and public intervention in the health care market could, at some point, be replaced with a more deregulated approach. And all of that, says Southwest Community Health Center Executive Director Samira Godil, could have considerable impact locally, directly affecting the population she serves — immigrants, refugees and the impoverished. "Health care in the United States is changing all the time, daily sometimes. There's so much change going on, so there's a lot of uncertainty for everyone — from health systems to safety net clinics to private providers," Godil said. The Southwest Community Health Center serves citizens who cannot afford health insurance and do not qualify for Medicare or Medicaid. Eighty-eight percent of its clients earn an annual income below the poverty line, Fifty percent are ethnic minorities, and 35 percent speak English as a second language. The organization provides services such as management of chronic diseases, women's health care, treatment of infections and minor injuries, prescription medication and more. It also employs a dental hygienist, who comes once a month, and a part-time nurse practitioner. Godil says the Trump administration's forceful push to deport undocumented immigrants hasn't affected the center's Southwest Portland branch, but it has caused reticence among undocumented immigrants at its Hillsboro location to seek care — particularly after an Immigration and Customs Enforcement truck was stationed near the facility. "It was pretty visible. We saw a huge drop in our patient visits because of that fear factor," Godil said. Though Southwest Community Health Center has been growing since its inception in 2005, Goldil says the Patient Protection and Affordable Care Act, which was passed through Congress and fully enforced by 2014, decreased the number of uninsured in Southwest Portland. But those numbers could rebound, she says, if policies championed by the current administration and Congressional leaders are implemented. This year, Republicans in Congress tried and failed to pass various replacements for the ACA — some of which would have nullifed the individual mandate that forces citizens to buy health care or face a fine; other parts of the legislation would allow states more latitude in reeling back health care regulations and spending. According to the Congressional Budget Office, these proposals would have caused at least 10 million American citizens to lose health insurance. Though the Republicans did not pass an Obamacare replacement this summer and fall, they could do so in the coming years. And Trump's executive order to end federal subsidies to insurance companies that decrease health insurance costs for low-income individuals could also cause the uninsured population to increase. However, Godil says the Southwest Community Health Center could brave any potential uptick in those in need of care. "We would have to ramp it up, but I don't think that would be a problem personally. It would be doable because I think the community engagement is amazing," she said. Though she has lived comfortably, poverty has been a ubiquitous presence in Godi's life. She was raised in Karachi, a coastal town in Pakistan; when she was 9 years old, Godil would wake up at 6 a.m., travel to slums to work at her family's immunization camp and fill out immunization cards for patients. From a young age, the urge to help the impoverished was engrained in her. "I learned that it was just normal to do that. That's what you do. When I meet people here who have no experience of giving back to the community, I feel very thankful that I was exposed to that and it became part of me," Godil said. After graduating from the University of Karachi, Godil joined her husband, an engineer, in the United States. Once she moved to Portland, she earned a job at Neighborhood House. Immediately, she says, she was shocked by the poverty in Portland. She met numerous kids inflicted with serious illnesses who did not have health insurance. "I never had a problem getting in to see a doctor. My kids had health conditions and it was never an issue to get medication or a prescription or see a doctor," she said. "When I joined Neighborhood House as a health coordinator, I was appalled that there were kids that had not seen a doctor for years." Tired of sending kids on the bus to a clinic downtown, where they often had to wait hours to be served, Godil decided to start her own organization dedicated to helping those who do not have health insurance. Since then, the center has expanded from one location that is open two days a week to two locations that are open four days a week. 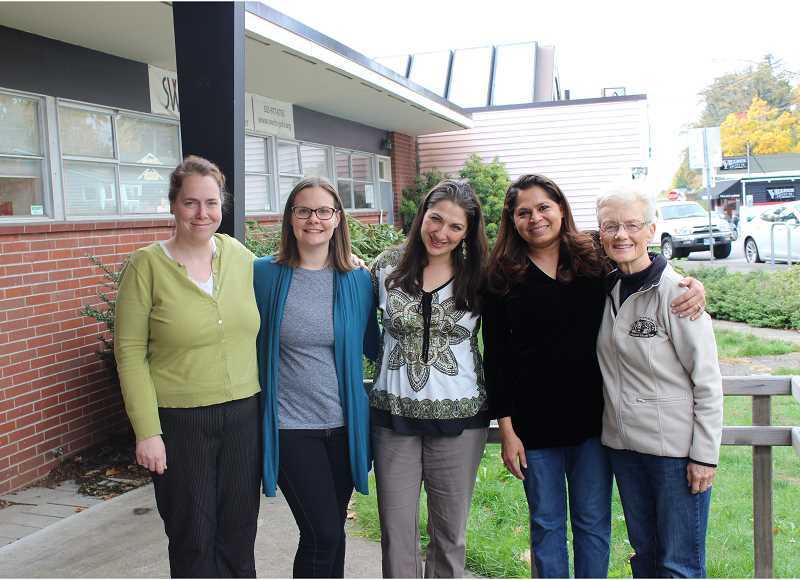 In 2009, Oregon passed the Healthy Kids program to provide health insurance for all children; that has reduced the need for places like the Southwest Community Health Center to offer child health care services, Godil says, so now the center serves mostly adults. "In the 13 years we've been around, we were seeing a large number of kids and that number has gone down, which makes me feel really happy because that means the kids are being covered," Godil said. Though it currently only accepts people without health insurance, Southwest Community Health Center is considering accepting Medicaid patients at some point in order to garner more revenue. The center relies on 300 volunteers and 10 rotating physicians; its revenue comes from donations and grants from organizations such as Kaiser Permanente and Providence Health System, Oregon Jewish Community Youth Foundation and Legacy Health Systems. Godil says one of her goals is to foster more continuity of care. Currently, patients may see one doctor during their first visit and then another doctor when they return. "They're very good doctors, but they usually don't see the same patient again, so there's no continuity of care. The nurse practitioner will bring in continuity of care and we're hoping that by next year we will be able to do some more of that," Godil said. For Godil, moving to America was a shock. But she was well-educated and spoke English fluently. Most of the refugees and immigrants she helps do not have such tools to succeed. Through her work with the health center, she says, she's learned more about the challenges they face. "It was easier for us. For the refugee population, it's extremely hard," Godil said. "Unfortunately, we meet people at the clinic who were doctors in their country, or lawyers or teachers. Here, they're working in McDonald's or are starting from bare bones, and they have to go get food from the food pantry. For them, it's a matter of self-respect, and it's very disrespectful for a person who is a doctor or a surgeon to have to stand in line for food." Some of the refugees, Godil says, fled countries dealing with extensive political turmoil and had to leave for their own safety. "A lot of refugees don't want to be here. They are here because of really harsh circumstances in their home country, and they were forced to leave. A lot of the refugees I meet, if they get a chance and things calm back down and there is safety at home, they would go back. They are here because of situations they had no control over," Godil said. Godil says such immigration policies and increasing cultural resentment toward immigrants and refugees has fostered an elevated sense of fear among the immigrant and refugee population. "They feel scared. They feel discriminated against. They feel targeted," Godil said. "The media does not help. All these bans and speeches by Mr. Trump do not help." Godil says she hopes to keep the organization solvent and is considering more-extensive adaptations to do so, because she knows that the Southwest Portland community might need the health center now more than ever. "I feel we're very fortunate. We have community support, but we also need to keep that support going and add more to it because it's hard to keep fundraising and keep the doors open," she said. "But we know that we serve a very vulnerable population and a population that has no other access to care."